It was great to be open again and having guests arriving and they were very excited to be fishing at Fireside Lodge again. To start the week it was unusual weather being 75 to 85 degrees but by the end of the week we paid for it as a severe cold front lasting 5 days blew in from the Northeast. One thing people always ask is how will this affect the fishing? My answer, I am not sure but what I definitely know is that is does affect all fishers. Frank Hazzard from Arlington, TX arrived for his 28th consecutive year and what amazing fishing he had. It was a different year having unusually warm weather with temperatures on most days being 75-85 degrees. 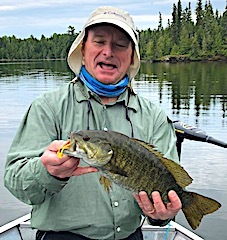 The quick warm up changed the location of Smallmouth Bass from their usual haunts and how Frank fished for them was different from most years, but the key to fishing is adaptability when conditions change. During his week stay he caught 100’s of Smallmouth Bass, many Northern Pike, Several Muskie up to 40”, and some Lake Trout over 30-inches. Frank always targets larger Smallmouth Bass and only counting the larger fish his total was 382, with 20 being over 18-inches, 58 at 17-inches or better, 76 greater than 16-inches and the rest 14 to 16 inches. In addition to his great fishing Frank, as in the past, made some new friends and helped other guests with fishing information. He also thoroughly soaked up the wonderful nature that surrounds us when fishing at Fireside Lodge. Father son Don & Greg Foley from Pasadena & Crownsville, MD returned for their 8th consecutive year. 1st day was a great start catching a grand slam combo of 10 Smallmouth Bass, Greg with a trophy over 18-inches, a 37-inch Muskie, 4 Big Lake Trout, and a bunch of Northern Pike with a 42 fish total. 2nd day was another Grand Slam catching all four species again ending up with a 49 fish total. 3rd day had them catching 24 fishing but Greg said it took them almost as many moves to do so. 4th day was their traditional day fishing with Frank Hazzard, as they have become friends over the years and always fish a day or two together. Well they had a wonderful day catching a lot of fish mixing it up between bunches of Smallmouth Bass & Northern Pike, 2-Muskie and 3 Lake Trout. Last day Greg and Don had another great day ending their trip with a very good day catching Pike and Smallmouth Bass, and Greg ended up for their 5 days landing 4 Trophy Smallmouth Bass up to 19-inches. Both left making another set of wonderful Father & Son memories, which of course is the biggest catch of all. Long time consecutive year guest Mike Uebelherr from Stow, OH came with old college buddy Bob Curry from Westlake, OH and his son Mike from Littleton, CO. for their first Fireside Lodge experience. 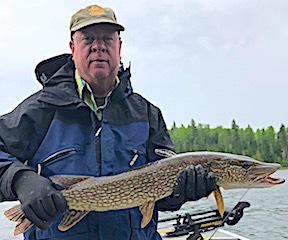 1st day was terrific fishing for Mike Curry as he caught over 40 Northern Pike up to 38-inches and at one time had landed 8 Pike on 9 casts. The others also caught fish but it seemed the secret to Mike’s success was the way he worked his lure of choice, which was a Fluke. 2nd day was also productive for Pike and they also saw some very large Northern Pike and Muskie that would not hit anything they threw at them. 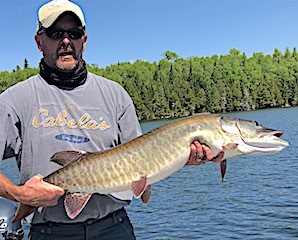 3rd and final day Bob had the hot hand catching 14 Northern Pike a bunch of Smallmouth Bass on his newly introduced to Ned Rig, and his first Muskie measuring a stout 38-inches. 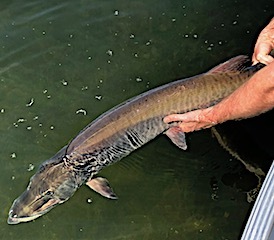 The others also caught many Pike and Mike Uebe landed a 35-inch Muskie. They were all smiles at the dinning room table reminiscing about their 3 days of great fishing and experiences. One special highlight was seeing a Moose in Chicago Bay. All had a great time and made wonderful memories. Fourth time returning were brothers Mike & Matt Chykta from Port Orchard, WA & Raleigh, NC, Resit Unal & Nick Christner from Yorktown & Barhamsville, VA. First day all caught fish but Mike had the largest catch which was a Muskie measuring a huge 39-inches and Matt caught his biggest Smallmouth Bass to date at 17.5-inches. 2nd day all had a good day fishing, no monsters but Northern Pike and Smallmouth for all with Nick catching his first Lake Trout ever. 3rd day Resit had the hot hand using his favorite lure, the #3 Blue Fox Spinner landing Northern Pike after Northern Pike on this small but productive lure. 4th day Resit was at it again catching over 25 Northern Pike while Matt caught a mix of Smallmouth and Pike. Mike and Nick caught their fare share of Pike plus 2 Lake Trout. 5th and final day Matt and Resit tore the Northern Pike up again just using Smallmouth Spinners and Resit landed 5 Northern Pike 30-36-inches. All left having had a great time and hope to return in the near future. 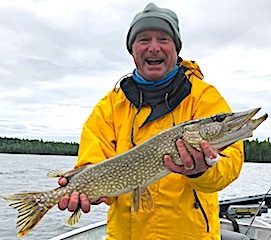 Long time return guests Paul Letourneau and Spencer Olson from North Oaks and Minneapolis, MN returned with anticipation of hunting our big trophy Northern Pike. 1st day was great catching many BIG Smallmouth Bass each landing 4 Master Anglers Award Trophy Smallmouth ranging from 18 to 19-inches and Spencer even caught one of his on an ice fishing rod. 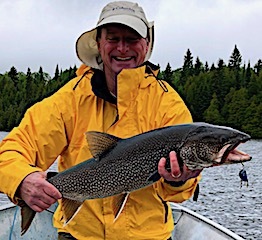 Second day was also a very good Smallmouth Bass day catching two more trophies; some Northern Pike with Paul catching a 38-inch Muskie, and both caught BIG Lake Trout. 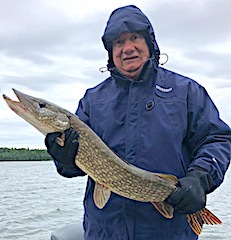 3rd day was fabulous despite the cold rainy weather catching lots of Northern Pike, Spencer landed a nice Muskie, both caught Trophy Smallmouth Bass over 18-inches and Paul caught 5 big Walleye on a small deep diving Rapala DT series crank bait. 4th day was a tough weather day with the persisting cold front combining with cold rain and winds. This made for a tougher fishing day for even the most experienced fisher but Spencer & Paul still caught some nice pike and a few walleye. 5th day had these two catching more Big Fish with Paul having the upper hand landing another 5 Master Anglers Award Smallmouth Bass 4 at 18-inches and 1 measuring HUGE 19.5-inches. 6th and final day the weather finally improved and they really enjoyed catching fish without having to fight cold rain & wind. Paul will be returning with his son and nephew in August so his departure will be short term & when leaving he was already looking forward in anticipation of his August Trip. Walter and Melissa North from Knoxville, TN returned for their second trip to Fireside Lodge. Very excited to be here they started out their first day catching some nice Northern Pike, with Melissa landing the biggest fish she ever caught. 2nd day was a very tough weather day with a severe cold front into its 3rd day which was combined with a cold spitting rain all day and a stiff wind. They lasted till just before noon and gave it up for the comfort of their warm cabin. 3rd day the cold front was still lingering but at least the sun appeared making it feel a little warmer and they did good catching Northern Pike, some in the over 30-inch category. 4th and final day it finally was sunny and calm and they enjoyed the day to it’s fullest catching fish and soaking up our wilderness which captivates us all. The left making some great memories to last until their next visit.